The year-end burst of activity—and publicity—around reform legislation seemed to have been triggered by a confluence of factors: increased speculation that the director of the Federal Housing Finance Agency, Mel Watt, might allow Fannie Mae and Freddie Mac to begin withholding payments due to Treasury under the net worth sweep agreement in order to build capital buffers (which subsequently turned out to be true, although the buffers were limited to $3.0 billion for each company); passage of the tax reform bill, which cleared the way for Congress to consider other legislation, and perhaps most importantly the announcement in September by Senator Corker—who for many years has been the most active Senate proponent of replacing Fannie and Freddie with a bank-centric alternative—that he intended to retire when his term expires at the end of this year. Following the Politico, Bloomberg and American Banker pieces numerous articles were written, papers released, statements made and speeches given about what might or should be in what quickly was dubbed “Corker-Warner 2.0.” And in mid-January FHFA director Watt weighed in with his views on reform. In a letter to the chairman (Mike Crapo) and ranking member (Sherrod Brown) of the Senate Banking Committee, Watt reiterated his “strongly held view that it is the prerogative and responsibility of Congress, not FHFA, to decide on housing finance reform.” He further told Crapo and Brown that in response to “a number of new or renewed requests” he was providing a seven-page paper titled Perspectives on Housing Finance Reform “for your information and for distribution to Committee members who have requested our views, and to others at your discretion.” When this FHFA paper was made public, advocates of all variants of reform alternatives predictably found elements in it that they contended supported their view of what was likely to happen next. Then, on January 30, an actual draft of Corker-Warner 2.0—labeled “staff discussion draft 29”—appeared, apparently through a leak. While several sources said that draft 29 was not the most current version, and that changes have since been made to it, the fact that the leaked document was the twenty-ninth draft meant that it was the product of a considerable amount of time, thought and effort. Draft 29 is an undisguised attempt to write the bill that the banks, and the MBA, have been asking for. The seven “Purposes of the Act” on page 1—adding an explicit government guaranty to mortgage-backed securities; protecting taxpayers with private capital and a guarantor-paid Mortgage Insurance Fund; ending “Too Big to Fail”; promoting competition through multiple credit guarantors; financing affordable housing with guarantor-paid fees; accommodating lenders of all sizes, and providing for a smooth transition to the new system—mirror seven of the ten principles in the MBA’s April 2017 proposal, “Creating a Sustainable, More Vibrant Secondary Mortgage Market.” And the three MBA principles that aren’t explicit purposes of the Act—a “bright line” between the primary and secondary market, preserving where possible the existing Fannie-Freddie infrastructure, and re-establishing the private-label securities market—are addressed in it somewhere. The objectives of draft 29 are to create 5 or 6 new credit guarantors, require them to hold enough capital that the government can add its explicit guaranty to their securities without putting the taxpayer at risk, and then, once the new guarantors establish themselves in the market, put Fannie and Freddie into receivership and liquidate them. But it’s clear from the draft’s 82 pages of text that neither its authors nor those who have been advising them have yet figured out how to accomplish these objectives. Instead, they rely extensively on two techniques: offering a soup sandwich of provisions designed to reflect the wishes of different special interests without attempting to reconcile their obvious inconsistencies (as in the proposed capital structure), and delegating to FHFA, or in a few cases Ginnie Mae, the responsibility for overcoming the financial, operational, legal and market challenges of chartering and capitalizing the new credit guarantors, getting them established without jeopardizing market liquidity, meeting affordable housing needs, and liquidating Fannie and Freddie without triggering an avalanche of new lawsuits—all after the bill has passed (which, in light of this feature, it has no chance of doing). So, how is it possible that a process begun almost a decade ago, which has had so many people working on it so intently for so long, could produce a result so empty and unimpressive? To understand this, you only need to know one thing: legislative mortgage reform is not, and never has been, about reducing the cost and expanding the availability of mortgage credit for consumers, or making the system safer for taxpayers; it’s about reducing the secondary market power of Fannie and Freddie to give more primary market power to the large commercial banks. The Milken Institute, a staunch advocate of bank-centric reform legislation, inadvertently gave this game away in a late-January paper titled “Bringing Housing Finance Reform Over the Finish Line,” when it explained, “The multiple-guarantor model’s existential challenge is creating a system that ends the current GSE duopoly. Without new entrants into the guarantor space, the reformed housing finance system could end up further entrenching Fannie Mae and Freddie Mac’s dominance.” The authors of this paper could not have been more direct: the goal of the banks’ and the MBA’s multiple-guarantor model isn’t to make the system better or safer; it’s to reduce Fannie and Freddie’s market power. Banks in fact have been pursuing this goal since the late 1990s, and to achieve it they and their supporters have repeatedly and consistently put out misinformation about Fannie and Freddie’s risks and benefits, about the true causes of the financial crisis, and about what needs to be done to reform the mortgage finance system. But this web of deception has consequences. To have any chance of getting what they want, the bank lobby has had to develop a public rationale for what they’re doing that they can say with a straight face (and if you’ve been paying attention you know this rationale has changed over time), and also come up with a mechanism that actually is workable. Neither is easy, but the second is exponentially harder than the first. The reasons banks give for needing to replace Fannie and Freddie are artificial, but the difficulties and risks of attempting to do so are real. Banks’ most recent rationale for insisting that Fannie and Freddie be subjected to legislative reform—rather than simply released from conservatorship with more stringent risk-based capital standards and tighter regulation—is that only Congress can create the multiple guarantors with explicit government guarantees on their securities (and not the companies) that can solve “Too Big to Fail,” because the failure of one or even two of the new guarantors won’t collapse the entire system. But here the banks and their supporters fall victim to their own fiction. In their zeal to address a problem they mischaracterize, they make the system vulnerable to a more serious problem they overlook. Critics and opponents of Fannie and Freddie suffer from self-induced amnesia about the sudden rise and spectacular collapse of the private-label securities (PLS) market. Their public story—which they’ve stuck to, despite readily available evidence to the contrary—is that the “failed business model” of Fannie and Freddie, and nothing else, is to blame for the financial crisis. Any serious student of the 2008 mortgage meltdown, however, understands and acknowledges the role played in it by the collateralized debt obligation, or CDO. It was the CDO that allowed Wall Street to become the buyer of otherwise unsalable tranches of subprime and other high-risk PLS tranches, which in turn allowed the PLS bubble to inflate by as much and for as long as it did. The CDO was alchemy, and what made the alchemy work was the insistence of the credit rating agencies that the performance of individual low-rated tranches that made up a CDO would be “independent, and not correlated,” and for that reason up to 80 percent of a CDO’s new tranches could safely be rated AAA/Aaa. That, too, almost certainly would not be true. It is far more likely that a small number of very similar credit guarantors either all will perform well or all perform poorly together. And if they all perform poorly, the government will have no choice but to bail out the companies, to keep the mortgage market from imploding. Banks’ contention that it is possible to “guarantee the securities but not the companies that issue them” has little in the way of substantive argument to back it up. But the need for multiple guarantors with government-guaranteed securities is the MBA’s and large banks’ latest cover story for their insistence on reform legislation, so that was what the staffers for draft 29 dutifully sought to create. The authors of the January Milken Institute paper knew this wouldn’t be easy, saying, “Ensuring adequate competition is a two-fold challenge: first, determining how to provide space for new guarantors to enter the market and ramp up market share in the face of the GSEs’ current market dominance; and second, determining how the GSE market share should be sufficiently ratcheted back to create space for new guarantors before these newcomers start guaranteeing loans without adversely affecting overall market liquidity.” Draft 29 makes clear that no one yet knows how to overcome either of these challenges, or indeed a number of others that emerge from the MBA’s April 2017 recommendations. Given the truly dismal condition of the work product to date for Corker-Warner 2.0, one has to wonder if a final version of this bill can make it to the Senate Banking Committee at all. And Senator Corker may be wondering the same thing. In a Senate Banking Committee hearing on January 30, Corker asked Treasury Secretary Mnuchin, “What would be your options if we don’t act?” When Mnuchin gave Corker the response I’m sure he thought Corker was looking for—“There are certain administrative options that we have; these entities are very complicated; I would just say my strong preference would be to work with Congress on a bipartisan basis to reach a long-term solution”—Corker paused for a moment, then in a low, flat tone, said, “Yeah.” After another pause he added, “But in the event this great bipartisanship doesn’t survive, and we don’t get this done—it’s a very complicated topic—what are some of the steps that you might take?” To me, this sounded like a man who knew his baby was in trouble. 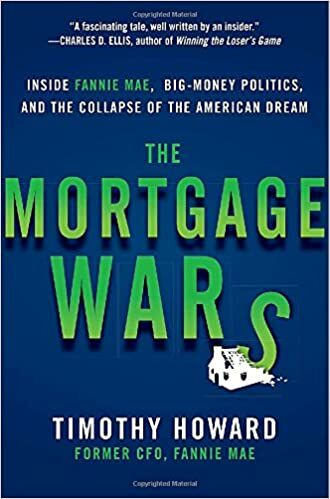 For nearly a decade, banks have been trying to pass self-serving legislation in the guise of mortgage reform, without success. The original version of Corker-Warner, made public in the summer of 2013, was the first bank-centric bill to be introduced, and it could not make it to the floor. Today the hill Corker-Warner 2.0 has to climb is steeper. One reason is that there now is a concrete, realistic and workable alternative in the form of the Moelis administrative reform plan, released last June, with which any legislative initiative inevitably will be compared. Another is that recently the community banking interests—led by the Independent Community Bankers of America and the Community Mortgage Lenders Association—have become much more open and aggressive in labeling Corker-Warner 2.0 a “big bank” bill, that would be bad for both smaller banks and consumers. Dorothy is pulling back the curtain.